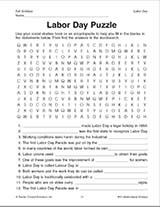 Teach children about Labor Day with this wordsearch. Teach children about Labor Day with these activities. Try a printable science activity that focuses on facts about a scientist.